Kate McCann and three friends discussed child-snatchers hours before daughter Madeleine disappeared, it has emerged. Dr Russell O’Brien, one of the so-called Tapas Seven, told police of the “haunting” conversation had while on holiday in Portugal last year. He said it came up after another father said he felt awkward photographing his own child. Men and children. Beware. Feel the fear… What of the other facts? Dr O’Brien, 37, was with his partner Jane Tanner, 37, Rachel Oldfield, 37, and Kate, 40. He said: “We then had a conversation about the ludicrous pressure on parents that they can’t take photos of their children. The words appear like a challenge for readers to libel someone. 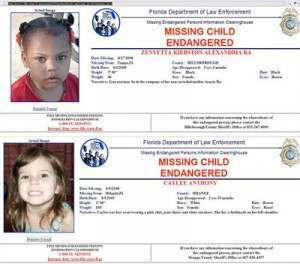 Thousands of kids go missing each day — so why do we never seem to hear about the African-American children? We only hear about Madeleine McCann. She is the benchmark for missing chidlren. What do JonBenet Ramsey, Madeleine McCann, Elizabeth Smart and Polly Klaas all have in common? They were all abducted by aliens? They all had six fingers on their left hand? They all liked pink? They are all girls who have been abducted — or in the most tragic cases, killed — and they are all attractive white girls. Spooky. Are photogenic white girls more likely to go missing, then? Do we value one child above another? But pretty and white are not the only children in peril, and are not the only ones who should have our attention. Nearly 800,000 children under the age of 18 are reported missing each year in the United States, according to the National Center for Missing and Exploited Children. Of those reported missing, 33% are African-American. So where’s the 24/7 coverage of their stories? Well, not all of the 800,000 are children. Not all stay missing. And not all of them are of a type of child that gels with the readers of national newspapers and the TV news. The website further exemplifies the bias by this statistic. A Google search on Caylee will garner about 600,000 results. “Can’t say the same for Zenyetta,” laments the website.